Classic Hollywood films will be screened for free at the new Portland Film Series starting Sunday, June 7, at Congress Square Park. 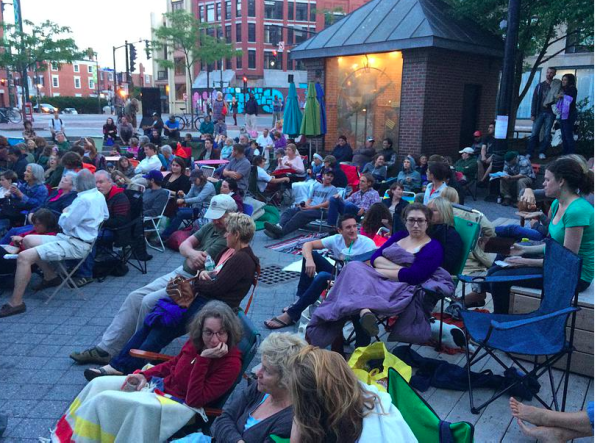 Classic Hollywood films, such as "Some Like It Hot," will be screened for free at the new Portland Film Series, which starts Sunday, June 7, at Congress Square Park. Classic Hollywood films, such as "Rear Window," will be screened for free at the new Portland Film Series, which starts Sunday, June 7, at Congress Square Park. PORTLAND, Maine — Can’t make it to a drive-in? Too nice out to slink into a darkened theater? Good news, reel buffs: A new summer film series opens in Portland this weekend, bringing classic films to a classic space. Hollywood chestnuts, such as “Casablanca” and “North by Northwest,” will be shown on the big screen in Congress Square Park on Sundays starting June 7. On alternating weeks, short films from local filmmakers screen in tandem. Sponsored by MENSK, a Portland-based organization that assists creative nonprofit endeavors in Maine, Portland Summer Films is designed for wide appeal. The baker’s dozen includes “American Graffiti,” “To Kill a Mockingbird,” as well as “The Muppet Movie.” Families and those looking for a low-key, free night on the town, this is for you. Portland Summer Films formerly was the itinerant Rooftop Films, an underground film festival that brought “Jaws” to the Eastern Prom last year. The fest popped up on garage rooftops across the city. Having a dedicated, central space and new screen — compliments of Southwest Airlines — makes the incarnation more enduring. The Friends of Congress Square Park helped secure the grant for the projector and are co-sponsoring the series, part of 100 free public events in the park through the fall. The location hardly is trivial. Just a year ago this public park was in jeopardy. Owners of the adjacent Westin Portland Harborview Hotel wanted to expand and yank a portion of the plaza from city-goers. The attempt created a sea of outrage. After a heated campaign, the park was saved by residents in a citywide vote. Now that the space is part of the commons again, this film series could be an important bellwether, as well as “a nice way to wrap up the weekend,” Henderson said. Portland Summer Films runs Sundays from June to August starting around 8 p.m., depending on sunset. For more info visit portlandsummerfilms.com. Bring your own lawn chairs and blankets. For refreshments, a food truck will be on site.